There have been many Paxos variants introduced over the years. These variants concentrate on making the basic Paxos algorithm more efficient. We talk about some of these variants chronologically below and point out the most important properties of each variant. Every replicated component in multi-decree Paxos is a process, actively sending and receiving messages. Disk Paxos is a variant of Paxos that replaces acceptor processes with disks that support only read block and write block operations to store the quorum state. This way, Disk Paxos does not need separate acceptor processes. In Disk Paxos, each leader owns a block on every disk to which it can write its messages. To run phase 1 of the Synod protocol, a leader executes the following for each disk. The leader writes a p1a message in its own block on the disk and reads the blocks of other leaders on the same disk to check if there is a p1a message with a higher ballot number. If the leader does not discover a higher ballot number on a majority of disks, its ballot is adopted. If it discovers a p1a message with a higher ballot number,it starts over with a higher ballot number. For phase 2, the leader repeats the same process with p2a messages to determine if its proposals are accepted. Multi-decree Paxos requires 2f+1 acceptors and f+1 replicas to tolerate f failures. Cheap Paxos uses only f+1 acceptors combined with f cheap additional auxiliary acceptors that are kept idle during normal execution, unless there is a failure. Cheap Paxos is a variation of the reconfigurable multi-decree Paxos algorithm that relies on the observation that a leader can send its p1a and p2a messages to a fixed quorum of acceptors. As long as all acceptors in that quorum are working and can communicate with the leaders, there is no need for acceptors not in the quorum to do anything. Cheap Paxos runs the multi-decree Paxos protocol with a fixed quorum of f+1 acceptors. Upon suspected failure of an acceptor in the fixed quorum, an auxiliary acceptor becomes active so that there are once again f+1 responsive acceptors that can form a quorum. This new quorum completes the execution of any outstanding ballots and reconfigures the system replacing the suspected acceptor with a fresh one, returning the system to normal execution. In Paxos, each decision takes at least three message delays between when a replica proposes a command and when some replica learns which command has been chosen. Moreover, if there are multiple leaders working concurrently, it takes four message delays for colliding commands to be assigned to different slots. Fast Paxos is a variant of Paxos that reduces end-to-end message delays experienced by a replica to learn a chosen value. Learning occurs in two message delays when there is no collision, and in three message delays when there is. The price paid is that 3f + 1 acceptors are necessary instead of 2f + 1. In Fast Paxos, the replica sends its proposal directly to the acceptors, bypassing the leader. Fast Paxos distinguishes fast and classic ballots. In fast ballots, after completing the first phase, the leader sends a p2a message without a value to the acceptors. Concurrently, replicas send their proposals directly to acceptors. When an acceptor receives such a p2a message, it can choose any replica’s proposal as a value to accept. In the absence of collisions, the acceptors end up accepting the same proposals and the end-to-end message delay for a replica is reduced from three message delays to two message delays. This scheme can fail if replicas send different proposals concurrently and the acceptors accept conflicting pvalues. In that case, a classic ballot—which works the same as in ordinary Paxos—can be used to recover. As noted, Fast Paxos does not handle collision efficiently. Generalized Paxos improves upon Fast Paxos by allowing independent commands to be executed in any order. Generalized Paxos generalizes the traditional consensus problem, which chooses a single value, to the problem of choosing monotonically increasing, consistent values. The traditional consensus problem creates a growing sequence of commands by assigning every command to a slot one-by-one. This problem can be abstracted by using command structures, or c-structs that are formed from a null element, ⊥, by the operation of appending commands. This way, c-structs are used to abstract command sequences. By abstracting the problem using c-structs, it can be shown that different c-structs can belong to the same equivalence class, that is, if a given set of commands do not have a dependency, multiple c-structs that are equivalent to each other can be constructed using this set of commands in different orders. Consequently, if we use a generalized consensus algorithm that decides on sequences of commands rather than the assignment of a single command to a specific slot, command collisions, as they happen in Fast Paxos, need not be resolved unless there is a direct dependency between the concurrent commands. Different command sequences can be accepted by different acceptors if they are in the same equivalence class, where the ordering of specific commands do not change the end state. Stoppable Paxos implements a stoppable replicated state machine. The execution of a stoppable replicated state machine can be stopped with a special command—once decided, no more commands are executed. This variant provides an alternative reconfiguration option: stop the current replicated state machine and start a new one using the final application state of the previous one. This way, the replicated state machine can be thought of as a sequence of stoppable state machines, each running with a fixed configuration. Mencius tries to solve the single leader bottleneck experienced in multi-decree Paxos. In Mencius, replicas, acceptors, and leaders are co-located, organized in a logical ring, and pre-assigned slot numbers to propose their commands. This way, leaders take turns proposing commands, increasing throughput especially when the system is CPU-bound. Because the initial leader for a slot is known, there is no need for phase 1 and the leader only needs to execute phase 2. If it has no command to propose, the leader proposes a no-op command. If the leader is faulty or slow, the other leaders can take over the slot by executing phase 1, but they can only propose a no-op command. Leveraging this knowledge, Mencius allows replicas to learn about a no-op command proposed by a non-faulty leader in a single message delay. In normal execution without process failures, the performance of Mencius is similar to multi-decree Paxos with a stable leader, without the leader bottleneck. However, idle and slow leaders can diminish overall performance. To limit the number of no-op messages generated by leaders, Mencius uses leases between leaders, where leaders can lease their ballots to other leaders for all slots less than a specified slot number. This can be done voluntarily by an idle leader giving up its ballots, or aggressively by a fast leader taking over the ballots of a slow leader. Vertical Paxos is a Paxos variant that enables reconfiguration while the replicated state machine is active and deciding on commands. Vertical Paxos uses an auxiliary master to decide on reconfiguration operations, which determines the set of acceptors and the leader for every configuration. In Vertical Paxos, the leader is set for every configuration and different ballot numbers have different configurations. 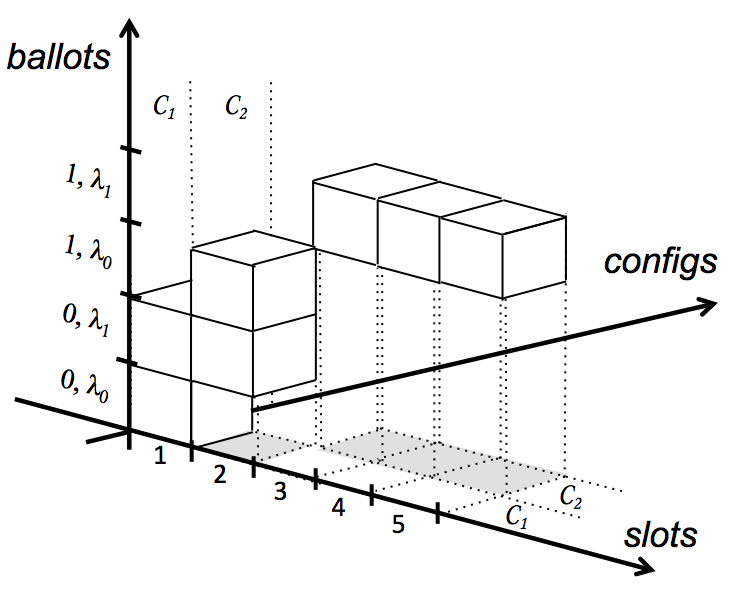 Unlike standard “horizontal” Paxos algorithms, every configuration has exactly one ballot number and a leader associated with it and a slot can have more than one configuration, as shown in Figure 1(b). 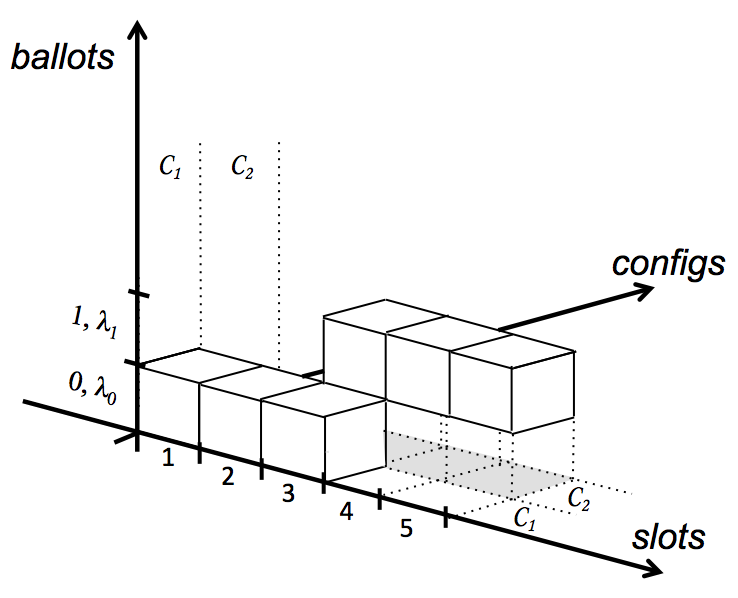 In horizontal Paxos algorithms, configurations can only change when we move horizontally from one slot to another, as in slot 3 in Figure 1(a). In Vertical Paxos, configurations change when we move vertically, as in slot 3 in Figure 1(b), but remain the same as we move horizontally. After a leader becomes active in a configuration of Vertical Paxos, it has to communicate with the acceptors from lower-numbered ballots to access old state. To limit the number of acceptors a leader has to communicate with, Vertical Paxos uses two distinct quorums named read and write quorums. When there is a configuration change, reads happen from the read quorum in the old configuration until this state is transferred to all live acceptors in the new configuration. Once the state transfer is complete, the new leader informs the master and the read and write quorums are unified. Vertical Paxos can also be viewed as a special case of the Primary-Backup protocol, where the leader for a given configuration acts as a primary. Egalitarian Paxos (EPaxos) is another Paxos variant that tries to solve the single leader bottleneck by allowing all replicas to receive values from clients and letting them propose values with one message delay when there is no dependence between commands. This allows the system to evenly distribute the load to all replicas; in addition it offers better performance for geo-replicated state machines by enabling clients to send command requests to the replicas closest to them. Unlike other Paxos variants, EPaxos orders commands dynamically and in a decentralized fashion. EPaxos assumes that replicas, acceptors, and leaders are co-located. In the process of proposing a command for a slot number, a replica attaches ordering constraints to that command, so every replica can use these constraints to independently reach the same ordering locally. EPaxos runs in two phases: pre-accept and accept. The pre-accept phase establishes the ordering constraints for a command c. Upon receiving c from a client, a replica becomes the command leader and sends a pre-accept message including c, its dependencies depc, and a sequence number seqc to 2f replicas. depc is the list of all instances that contain commands that interfere with c, and seqc is a sequence number greater than the sequence number of all interfering commands in depc. When a replica receives a pre-accept message, it updates its local depc and seqc attributes according to its state and replies to the command leader with this state. The command leader might receive replies from the quorum with depc and seqc matching in all replies—in this case it can commit c and send a commit message to all other replicas and reply to the client. In the other case, the command leader might receive non-matching depc and seqc in the replies. Then, the command leader updates its state and goes on to the accept phase. In the accept phase, the command leader sends an accept message including c, depc, and seqc to at least f other replicas. Upon receiving the accept message, the replicas update their state and send a reply to the command leader including c. When the command leader receives at least f replies, it can send the commit message to all replicas and reply to the client. Following this protocol, every replica creates a local dependency graph for every command and executes every command recursively in accordance with this dependency graph.